General Information about termites and how they can damage your home. You may not see them until it's too late. Termites are tough. Determined. Highly efficient. And chances are you'll see no evidence of their work until structural damage has been done. Subterranean termites, the most common kind, live in colonies in the soil, from just below the surface to as much as 12 feet down. Each colony is built around a king and queen, whose sole job is reproduction. Worker termites "commute" between the colony and sources of food, including wood fibers and other forms of cellulose which they eat, digest and share with other members of their colony. They keep busy 24 hours every day. These workers rarely break through the surface of wood; instead they hollow it out from the inside. So the vast majority of their work is invisible. Until something gives way. Is it a termite? Or an ant? Maybe your next question is "Who cares?" But it's important to know, because measures for controlling the two pests vary. Winged termites are usually only 1/8" or so in length, and have straight antennae and no "waistline." Their wings are long and of equal length. Ants are often several times larger. They have elbowed antennaee and three distinct body segments, with very slim waists. Their front wings are much longer than the back ones. Termites break off their wings; ants do not. People are concerned - with good reason - about the possibility of damage and loss from fires, and from severe weather. But statistics show that there's far greater reason for concern about damage caused by subterranean termites ... the very costly "underground movement"
Termites can cause more than $750,000,000 in damage each year. That's more than is caused by all fires and storms combined - and earthquakes as well. Granted, the damage caused by termites isn't as dramatic as a fire or tornado. And it may not be discovered for years. But eventually it can lead to sagging floors. Loose trim. Cracked plaster, and more. Eventually, major repairs to the structure may be necessary. As the map shows, no one is completely free from the threat of termites. Although they are more of a problem in the South, they are present to some extent in every state except Alaska. It has been said that in this country there are only two kinds of homes: those with termites and those that will have termites. Termites eat wood. In their natural state, they eat fallen logs and stumps off the forest floor. But on your property, they can eat away the equity you have built up in your home and property. Termites infest millions of homes nation-wide, causing over $750 million in damage annually, according to the United States Department of Agriculture. Only a trained professional understands the intricacies of how a termite colony behaves. Using an advanced material, such as Dragnet FT termiticides, a skilled, professional applicator can effectively protect your housing investment. Because termites need moisture and have a low tolerance to air and light, they live underground, attacking a home from below. A loose mortar joint, a minute space around a drain pipe, or a settlement crack in the basement is all they need to gain entry. Aren't new homes and houses with concrete slabs virtually termite-proof? The experience of homeowners nationwide shows that no home, new or old, is safe from termites. By building mud tubes, termites can cross concrete, brick, cinder block, metal termite shields, pre-treated wood, or any barrier other than a professionally-applied termite treatment. If I haven't seen swarming termites, or traces of damage, can my home still be in danger? Unfortunately, yes. When a colony swarms, the winged termites may be in the air for just a few minutes and you may not see them. 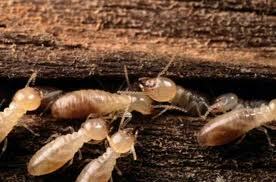 Termites eat wood from the inside out, making their activity detectable only by professional termite inspection. When is the right time to call in a termite professional? Termite treatment is a fixed cost. But the longer you delay treatment, the more damage termites will do. Repairs will become more extensive, and more expensive. Generally speaking, the sooner you approve treatment, the better. How does a professional inspection uncover activity that's invisible to me? While much termite damage is hidden, termites have few secrets to the eyes of a professional. He knows the conditions termites favor, and how to uncover termite activity which the untrained eye might pass over--with damaging results. What will a professional do to get rid of the termites? Create a barrier between your home and the termites, blocking them from your house. Treatment begins with a thorough inspection. Then, an analysis of your home and property. Finally, applying materials to effectively repel termites. How will you achieve this invisible barrier? Methods vary with each house, depending on the type of foundation or basement, construction materials, number and type of porches, patios, chimneys, etc. By digging narrow trenches along walls and drilling through horizontal surfaces and into voids, materials can be applied where they will kill termites within your home and block the colony's re-entry. Won't this kind of thorough treatment be a lot of trouble? No. Modern termite control treatment will usually take a single day, or less, with very little upset to your daily routine. And, considering the fact that a home is the largest single investment most American families will ever make, protecting its value is not much trouble at all. What if termites do invade your home? You can't afford to ignore the possible presence of the termites in your home. If left alone, these voracious wood-eaters can quickly cost you thousands of dollars in repairs. That's why regular termite inspections by a qualified pest control professional are essential. Phantom® Termiticide * Insecticide controls all species of subterranean termites quickly and effectively-- even in structures where other termiticides have failed. Your pest control professional will apply Phantom around your home and in areas where termites have been detected. Phantom is totally undetectable to termites, so they unknowingly pass through the Phantom Perimeter repeatedly, then they carry Phantom to their nestmates. 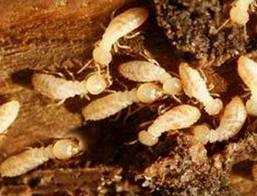 Within days termites begin to die, and in weeks, the infestation has been eliminated. The Phantom Perimeter then guards your home against future infestations. No hassles. No odor. No termites. You'll be happy to know that Phantom has virtually no odor and poses no threat to your family or your pets. The only way you'll know that Phantom is there is because termites won't be. Trust Your BASF Certified Phantom Applicator. Only pest control professionals trained and certified by BASF Professional Pest Control are allowed to apply Phantom termiticide-insecticide to ensure that your termite problem is being expertly eliminated. If you have any questions about Phantom® Termiticide * Insecticide, or other termiticides, please contact us. The tomato hornworm is a large (3 1/3 to 4 inches when mature) pale green caterpillar with white and black markings. A brown form also occurs although it is not usually as common as the green form. The name hornworm comes from the fact that these caterpillars have a projection or a spike on one of the last abdominal segments. The adult moth, called a sphinx or hawk moth, is a medium to large, heavy-bodied insect with narrow front wings. The body is spindle-shaped, tapering at both ends, and the antennae are fairly thick. The adult is a mottled gray-brown color with yellow spots on the sides of the abdomen and a wing spread of 4 to 5 inches. The hornworm feeds on the leaves and new stems of the tomato plant. During July and August they also occasionally feed on the fruit. They are often noticed in the home vegetable garden because of their large size or because the foliage of the plant just disappears. In late spring the adult moth lays eggs on the undersides of tomato leaves. The eggs hatch in 6 to 8 days and the larva passes through 5 or 6 stages reaching full growth in three to four weeks. The full grown larva then burrows into the soil and transforms into the pupal stage. The pupa may remain in the soil all winter and emerge as a moth the following spring, or if the weather conditions are suitable, the moth may emerge from the pupa in 2 to 4 weeks. The emerging moth makes its way to the soil surface and mates and then begins to deposit its eggs on the tomato plants for the next brood of hornworm.